« The shower blocks has been completely renovated this year. We are going to move the mobile home to get out the places for motor home and caravan. The oldest mobile home are going to change by the new one all comfort and air-conditioned. The swimming-pool terrace will be completely renovated with a lounge to see the beautiful view on the Luberon while sipping a drink or cocktail. Overlooking the Luberon with a breathtaking view, the Domaine du Camping des Sources is the ideal place to recharge your batteries and rest. In a typically Provençal setting, the campsite has managed to preserve a preserved nature while conserving its holm oaks, its terraces and its stone buildings of Gordes. This gives the place a simple and natural charm that invites you to calm and rest. 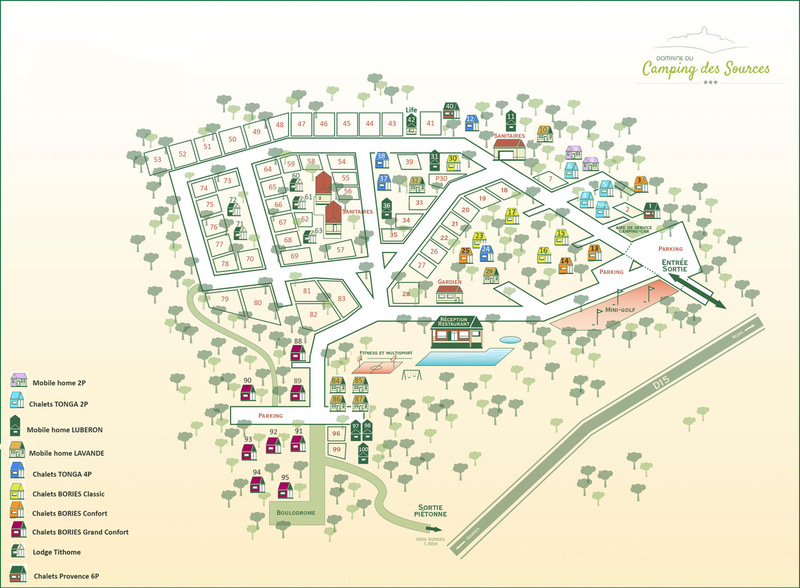 Located 5 minutes from the centre of the village of Gordes, in one of the 100 most beautiful villages in France, Domaine du Camping des Sources will be the starting point of your holidays and will allow you to travel through the Luberon by car, on foot or by bike. Due to the configuration of the campsite, the disabled access is difficult.